We already had the foundations of our pitch, but a full day of pitch training with Maryanne Johnston let us work on both delivery and content to hone our 1 minute pitch to perfection with expert and peer feedback. This was crucial to making sure it was comprehensible to a wider audience. We were really lucky to be selected, following audition, to do one of the full-length 6 minute pitches on the main stage. Once again, we had the foundations of our pitch, but the work on the 1 minute pitch had helped us to develop the language and style. Working with Joe Tree really sharpened up the visual messaging and graphic design so we had presentation slides to be proud of. In fact, the professional look of our presentation attracted positive comments from a number of people we pitched to. EIE wasn’t about making new connections for us. We already had conversations ongoing with several potential investors, so it was much more about putting on a good show for the people we already knew. We knew that Mercia would have a good contingent of senior people there, and we invited up a few of our London contacts who were quite persuadable especially when offered invitations to the dinner. We also knew we had quite a few other potentials in the room. Some of those discussions were quite advanced – with at least two parties talking about issuing a term sheet and starting to talk about what the terms might be. Pitching on the main stage really helped us look confident and credible and helped move several of our conversations on. We got a fantastic response, and that in itself created a little bit of urgency, as potential investors could see we had interest from others, and that we had good prospects of doing a deal – if not with them, with someone else. 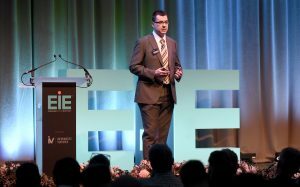 Within a few days of EIE we had several further meetings organised, and felt a real sense of momentum. Crucially we also got a term sheet from Mercia a few days after EIE, and although it took a couple more weeks to get everyone comfortable with the detail and get it signed, that was the biggest hurdle on our path to investment from Mercia. I have absolutely no doubt that EIE played a key role in showcasing Cyan Forensics to the senior team at Mercia, which was instrumental in getting the term sheet out, and ultimately completing the deal. Thank you to everyone who supported and guided us through the EIE process, especially the team at Informatics Ventures – you made a real difference to us.